Diana Syrse Valdés Rosado (b. 1984 in Mexico City) is a singer and composer from Mexico City. Her music has been performed in Mexico, Cuba, Canada, United States, Germany, China, Argentina, France and Holland. 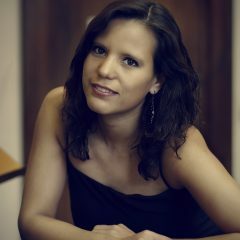 She has worked as a resident composer for the Schauspiel Frankfurt, the Theater Akademie August Everding, Kapitael Zwei Kollektif, LIEM, Túumben Paax, Breakout Ensemble, and as a part of the Counterpoint of Tolerance Project writing for opera and musiktheater. She has won the Musikförderpreise der Landeshauptstadt München, the commission by the Siemens Stiftung, the prize given by the Bayersiche Akademie der Schönen Künste, the Residence at the Banff Center (Canada) and Akademie Musiktheater heute supported by the Deutsche Bank Stiftung and was selected as a composer and choral conductor for the VocalEssence ¡Cantaré! program. She studied at Indiana University, CalArts and a second Master Degree at the Hochschule für Musik und Theater, Munich, Germany. In 2016 premiered her last opera “Marea Roja” about femicide in Mexico City and is currently co-writing another opera for the Opera Stabile in Hamburg.